We are able to refill almost any container you bring to us, as well as make 12, 14, 16 or 18″ hanging baskets up from new. 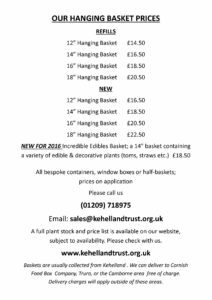 Please have a look at our price list, or call in to us to see what we’ve been making up already, or to choose your favourite plants to make up your own at home. 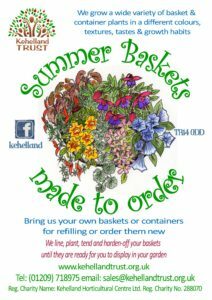 We will line, fill, plant, feed, nurture and harden-off your baskets and then let you know when they are ready to collect.